The real aim behind the As Seen From The Sidecar trip is to raise awareness and money for modern day slavery in the UK and abroad. It is believed that in the UK alone that 13,000 people are victims of slavery and 45.8 million globally are impacted. Teaming up with the charity Unseen UK, who run the UK Modern Slavery Helpline, Matt and Reece help to raise the profile of slavery by travelling the globe; sharing the stories of the people they meet on their travels and hopefully setting a new World Record. “When we originally thought up the expedition the idea was to go through as many borders as possible in the most ridiculous way imaginable to show how ridiculous we thought it was that people were treated differently simply because of which side of a border they were born on. Covering almost 40,000 miles over 50 countries, the As Seen From The Sidecar duo will set off on Saturday 21st October from the Ace Cafe London. All are invited to join them on the first leg of their ride from London to Paris, it only costs £25 to join the rally and that includes your return Eurostar trip! You can find out more information about the event here. “Unusual answer but I always say (leaving) Dover, as then I think it will really hit home that we are on our way, but also there are loads of amazing places we can’t wait to visit and what’s most exciting will be meeting people and telling their stories of everyday life to people back home. Take a look at our gallery below to see how As Seen From The Sidecar have been preparing for their trip. So the complete journey will be done on a scooter and sidecar, and with only just over a years’ experience of riding each – it’s not going to be an easy task. They’ve managed to pack in a lot of riding experience over the last year, more than some might accomplish in a lifetime, including London to Lands End to John O’Groats on 125cc bike with L plates on just as a warm up – we won’t mention the trip to a&e and a minor fall in McDonald’s car park though! Matt fancies himself as the captain of the trip, but with over 40,000 miles to cover there’s no doubt that there will be a split share of driving and snoozing in the sidecar over their 18 month trip. The trip will display lots of obstacles and challenges from the variation of landscapes and weathers on city-styled scooter and a sidecar, not the most common or reliable means of transport. “We will be going on a Honda SH300i with a custom built sidecar. 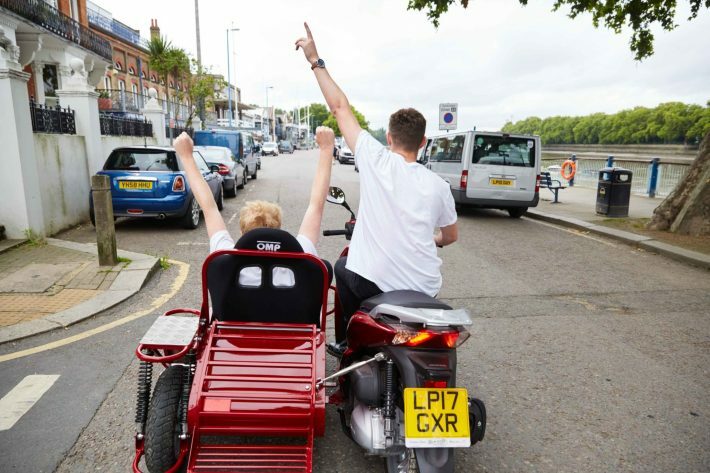 We approached various sidecar manufacturers who said they could help but it was proving costly… then came across two brothers named Charlie and Richard who are essentially sidecar enthusiasts and great guys that helped us build it on a charity budget! Can they set a new World Record? There’s a few ways that you can support Matt and Reece on their upcoming challenge, from making a pledge to supporting any upcoming events. “We’ve teamed up with Unseen UK, who run the UK Modern Slavery Helpline, to put it on and we’re hoping to raise awareness of the 13,000 people living in slavery in the UK. If people are feeling generous sponsor the expedition, a minimum of 50% of the proceeds raised will be going towards the organisations and charities we will be supporting throughout the expedition. Check out their Facebook page to keep up-to-date with As Seen From The Sidecar’s adventure!